C’est dans des circonstances qui restent à déterminer que fut rédigé à Étampes plutôt qu’ailleurs, le 23 octobre 1921, le texte de cette brochure, ensuite imprimée à Paris, et visiblement destinée à vanter, auprès d’un public américain, les mérites d’un nouveau type d’aéroplane. Merci à François Jousset de l’avoir saisi à l’intention du Corpus Étampois. 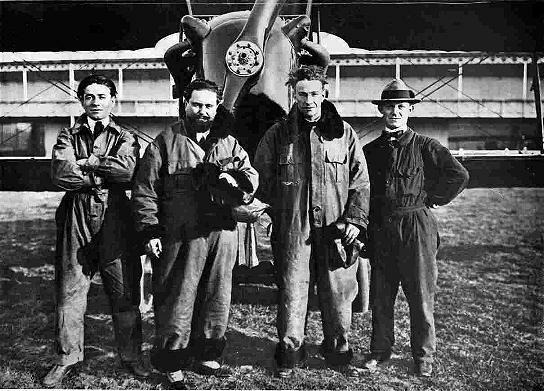 Inventé par René Tampier, et fabriqué dans ses ateliers de Boulogne-sur-Seine, cet avion avait été exposé puis promené à travers Paris, lors de la grande exposition aéronautique du 11 novembre 1921. Pourquoi l’auteur a-t-il jugé à propos d’indiquer qu’il avait rédigé cette notice à Étampes? Sans doute pour profiter de la notoriété de notre ville dans les milieux aéronautiques américains, au moins depuis la publication, en 1913, du livre du capitaine C. Mellor, The Airman. Experiences while Obtaining a Brevet in France, premier récit détaillé au monde de ce qui se vivait dans une école de pilotage, à savoir dans celle de Farman, à Étampes, à côté de celle de Blériot, qui n’était pas moins célèbre. De nombreux records du monde y avaient été établis dans les premières années de l’aéronautique. 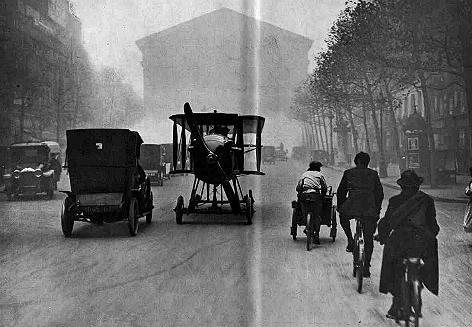 The Aeroplane-Motor Car Price 60 cents Running with folded wings in Paris, place de l’Etoile, de la Madeleine, de l’Opéra, on the height of Montmartre and flying, wings extended, at Buc. [p. 4] 2° Garage problem. The possibility of leaving the house in an aeroplane, reaching a starting ground, returning to the said place, bringing the aeroplane back and garaging it by the side of the motor car, opens new vistas to every one, the cost of hangar, mechanics, etc. being eliminated. 3° Problem of returning in case of a breakdown. The very high cost of labour for dismantling, placing on truck and transporting the aeroplane in case of a breakdown, is now replaced by the low cost of returning by road. 5° Problem of control of the inner parts of the aeroplane. 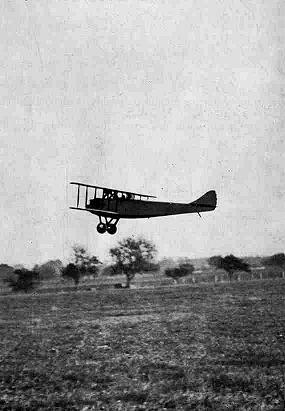 a) In large aeroplanes, a greater force than that of a man will be useful for keeping the aeroplane in its direction, and it will be supplied by the small engine. b) In the latest aeroplanes, the lighting is supplied by a dynamo driven by the large engine. The small engine avoids the necessity of using for that purpose part of that power of the large engine. c) For operating certain apparatus intended for wireless telegraphy, photography, etc. propellers controlling the differences of speed of the aeroplane, are something used which produce resistance to the advance. The auxiliary engine allows a more mechanical control. d) In case of control in the air of an aeroplane without a pilot by another, the small engine will be supply the necessary power. f) The forced feed of the engines could be effected by means of a turbine driven by the small engine, the power of which will then increased. When flying at high altitudes, the use of a source of power independent of that of the engines of the aeroplane, from the point of heating, ventilation, etc. is of great value. a) The aeroplane-motor car can accompany cavalry or artillery. 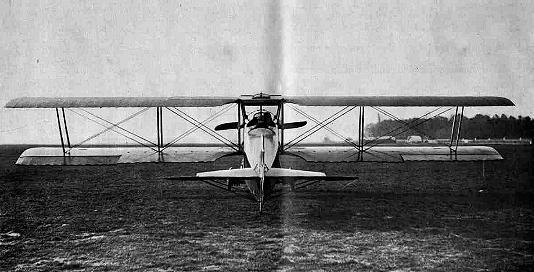 This aeroplane with folding wings is more particularly valuable for the navy when it is desired to carry on board ship aeroplane ready to fly. The starting of the large engine by an auxiliary petrol engine is a useful on water as it is on land. In flight at Buc. In Paris, place de l’Etoile. At the moment of starting from the ground. Avenue des Champs Elysées. 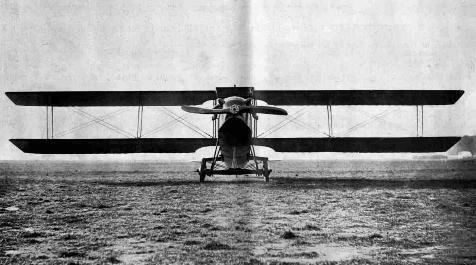 c) An ordinary aeroplane of the size of that of Mr. Rene Tampier, requires several hours for erecting and adjusting it ; a squadron provided with Tampier machines is ready to fight in less than an hour. Moreover, ten aeroplanes-motor cars cab be stored where formerly there was room only for two or three ordinary aeroplanes. d) The Tampier machine is easier to manage on the road than a lorry ; it runs faster, it can start on any ploughed ground, provided that the wheels do not skid ; it can climb any hills. It does with hand labour, tractors, etc. required in the case of long journeys. Machines of 10 and 15 tons can easily be moved with an auxiliary engine. e) In large machines, the manipulation of bombs, torpedoes, etc. can be facilitated by the use of the auxiliary engine. f) The controls of machine guns, guns, etc. could depend on the small engine, and will continue then work even in case of a breakdown of the large engine. [p. 12] h) The folding cell has the advantage of not requiring a specialist for its re-erecting. A squadron without a specialist fitter of cell, could fly after the wings have been examined by its chief, any want of adjustment being clearly noticeable when they are folded. i) A whole new organization of squadron could be provided with Rene Tampier’s machines: transport of tents, preparation of landing ground, hangars, etc. are simplified. The chances of destruction are reduced owing to the facility of movement of the machine, equal to that of a car. In front of the Grand Palais. Mr. Rene Tampier has utilized on his machine a 300 H.P. Hispano-Suiza engine provided with the Rene Tampier feed by a pump in the tank, driven by the engine, bloctube carburetor without a float. His experience with the feeding of aeroplane engines has enabled him to do away with the variations due to defective carburetion, and to carry out quickly his program. 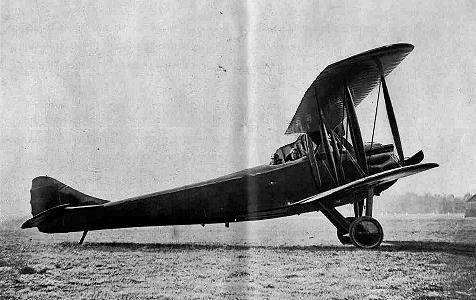 Mr. Rene Tampier has chiefly tried to produce an excellent aeroplane. He calls an excellent aeroplane that which obeys at once and in an absolute manner the pilot who must not have to make any effort for keeping his aeroplane in position, bringing it back to the said position or inclining it. The steering, inclined, by hand wheel, differs from those generally used. The axle is fixed; the adjustable journals are controlled by the connection bar, sandows forming spring, make it possible to move them up and down. The moving parts are light. When flying a part of the steering gear is folded under the body of the aeroplane, the other one, comprising the wheels, can be dismantled and securely fixed in the machine. On the ground, the aeroplane is a easily managed as in the air. 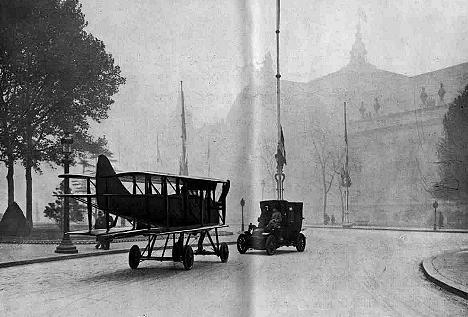 Having started from Buc, after two days flight, it passed through Versailles, Boulogne sur Seine and got into the Grand Palais on the eve of the opening of the aeronautics exhibition on the 11th November 1921. 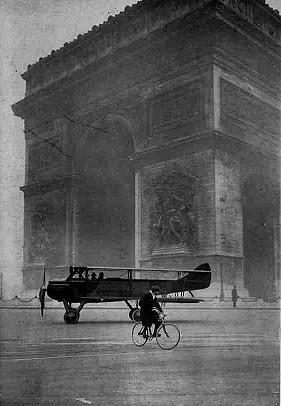 The day after closing, the aeroplane-motor car climbed Montmartre, moved about then for two hours in Paris proving that it could climb any gradients and move in the thickest traffic. Beautifully sprung, it exceeds 15 miles per hour. When the machine which has been running on the ground, is transformed in order to fly, the steering gear can be simply folded under the fuselage, without dismantling it; the time required for complete transformation, including the unfolding of the wings, is then about twenty minutes. The machine was built in Mr. Rene Tampier’s workshop, 1 , rue de Bellevue, Boulogne sur Seine; where the following parts were machined on this machine tools: cylinder, gear cases, differential, landing frames, etc. A work shop has built for the first time the motor car part and the aeroplane part of a machine. The quick getting ready of the machine is due to the fact it is the outcome of several years of study and of practical work placed at the disposal of a high conscience which has carried out its idea with devotion and all the time required. On the 9th October 1890 a mechanical bird ridden by a man, left the ground for the first time; it was animated by the genius of the great Frenchman, Ader. It took possession of the air, then it descended and stopped. It was then no longer anything but a poor thing made of wood, of metal and canvas, a body without soul, which was moved with difficulty, whilst around it jumped about its master : the bird. The mechanical bird is now complete. It now knows how to use its feet. At Montmartre, after having climbed the rue Lepic. Source: Brochure anonyme (collection particulière). Saisie numérique du texte et des images: François Jousset, septembre 2001. Introduction et mise en page: Bernard Gineste, novembre 2001. François JOUSSET [éd. 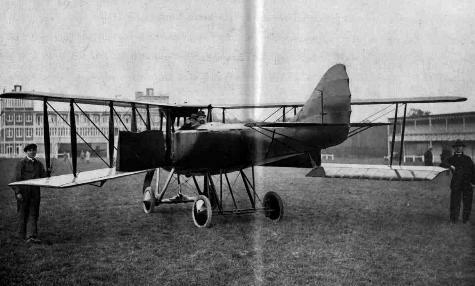 ], «An aeroplane-motor car, made in France by René Tampier (brochure anonyme dont la préface est datée d’Étampes)», in Corpus Étampois, http://www.corpusetampois.com/che-20-19211023tampier.html, 2001. 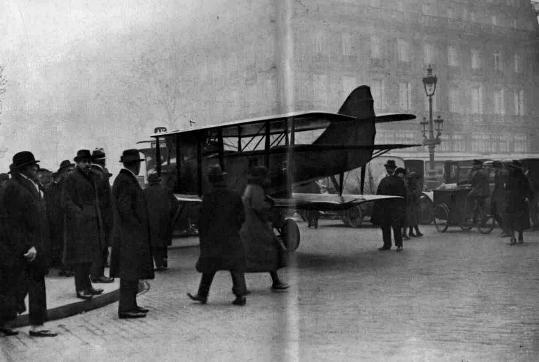 E. H. LEMONON, «L'avion-auto René Tampier», in Les Ailes 31 (19 janvier 1922), pp. 3-4. 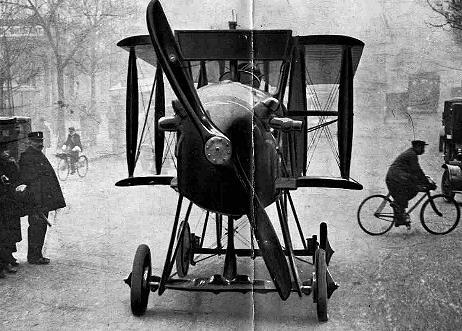 B. PARMENTIER, «Tampier ‘Avion automobile’ (1921, expérimental, France)» [avec une autre photographie appartenant à la collection de Jean Michel Ollivier], in Aviafrance, http://www.aviafrance.com/9880.htm, 2004, en ligne en 2006. MAISONS D’AILLEURS [«Musée de la science fiction, de l’utopie et des voyages extraordinaires» à Yverdon-les-Bains (Suisse)], «Exposition: ‘Les voitures volantes, souvenirs d’un futur rêvé’ à la Maison d’Ailleurs du 2 octobre 2005 au 23 avril 2006. Dossier pédagogique», http://www.ailleurs.ch/pdf/vv_dossier_p.pdf, en ligne en 2006. 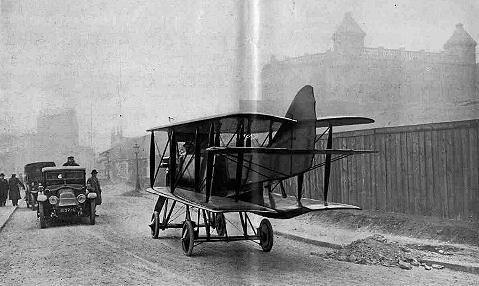 «Le véritable pionnier du domaine des voitures volantes est l’Américain Glenn Curtiss, qui présente en février 1917 un engin hybride baptisé Autoplane. Mais celui-ci ne dépassant pas le stade des modestes bonds, le projet sera très vite abandonné. PRE-WAR-CAR [«The daily Magazine & Marketplace, dedicated to the pre 1940 car»], «Rene Tampier carburettor / carburettors wanted, Aero bloc-tube (1910-1920)», http://www.prewarcar.com/parts/info.php?id=1857, en ligne en 2006. Jacques BORGÉ [d'après le livre non publié de], «L'avion automobile de René Tampie», in Entrevoisins.org [«Le site des aéroports franciliens pour leurs riverains»], http://www.entrevoisins.org/SiteCollectionDocuments/Fiches_histoire/1997_EV25.pdf, en ligne en 2012.